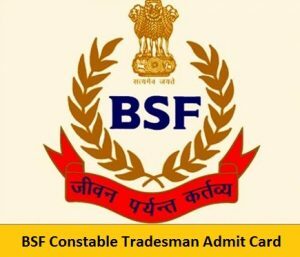 Are you waiting for BSF Constable Tradesman Admit Card 2019? Then you are at the correct place. Our page provides you with the complete details about the admit card and the exam dates. This is a good opportunity for the aspirants who are interested in the Border Security Force. The Officials of the Border Security Force announced that there are 1763 vacancies for the post of BSF Constable Tradesman. The examination will be conducted in the month of August 2019. You can also visit the official website bsf.nic.in for further details. BSF Admit Card is very important for the aspirants appearing the examination. The exact information about the examination date and the admit card release date is not yet released by the Border Security Force. It is stated that the examination will be conducted in the month of August 2019. The admit cards will also be issued to the aspirants a few days before the examination. Hence, candidates who are appearing for the exam, stay connected with our page. We will provide with the updated news. Also, you can check the syllabus for the exam. The below sections will provide you with detailed information about the examination. You can also find the mandatory documents, steps to download the admit card. The following information will be present on the BSF Constable Tradesman Hall Ticket 2019. Aspirants need to carry some important documents to the examination center. Without the documents, they are not allowed to the examination hall. These documents are needed for the security purpose. So, before entering the examination hall candidates make sure that you are carrying the documents along yourself. List of the documents is given below. You can take any of those documents for the examination center. Initially, Aspirants need to visit the official website i.e., bsf.nic.in. On that home page, you can find some sections. Now, search for the required link by entering into those sections. After finding the required link, click on that link. Now, fill in the details and download the admit card. Take 2 or more hard copies of the admit card.